Japanese online store Fukkan has a pre-order page for Gigamix that describes the book as a compilation of Ariga's works from Comic Bom Bom and numerous Kodansha publications. There's even a small hint that the book might contain unreleased comics. 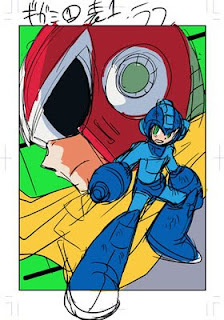 More Gigamix updates are expected to appear on Ariga's official blog. Based on the top right screen shot, battles appear as if they will go unchanged from their appearance in the original game (comparison pic). The custom screen is slightly different from the original with chip selection being cut down to two rows as opposed to three. This was done to accommodate the addition of letter codes below each chip icon; a standard practice since EXE 2 and onwards. 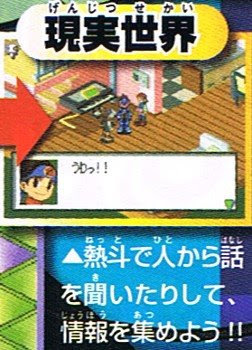 The other new image (bottom left) depicts Rockman.EXE in the school computer; new mugshot present. 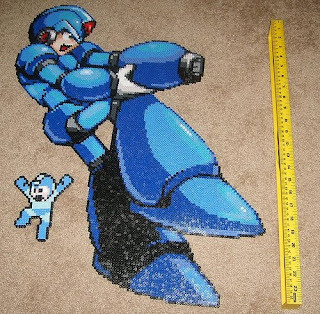 Spotted over at Sprite Stitch Board, a handsomely made Mega Man X sprite built entirely out of perlerbeads. X towers over his 8bit counterpart at nearly two feet in height, sporting well over fifteen different colors. Needless to say, that's some might fine craftsmen ship right there. More details and an additional photo at Sprite Stitch. Hot on the heels of the Servbot pudding comes another strange Tokyo Game Show food product: Rockman Dorayaki. 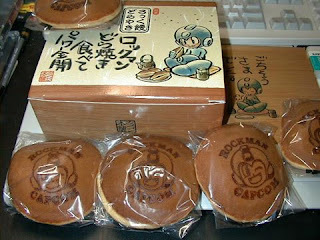 Half dozen packs of Rockman branded dorayaki were given away at Tokyo Game Show '99. 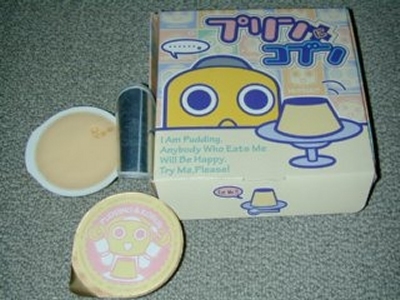 Unlike the free Servbot pudding of TGS 2000, Capcom booth attendees were forced to fork over 500 yen per pack. For the uninitiated, doryaki are kind of like pancakes more or less. Essentially, it's spongecake filled to the brim with sweetened red beans. Best eaten grilled. 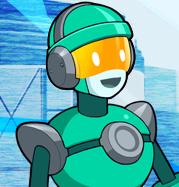 ...and it looks like I'll be contacting Andrew Francis, the voice of NT Warrior's Mega Man.EXE, for an interview. In the meantime, I'd like you guys to go on ahead and send your questions to Andrew in the comments. I'll forward them to Mr. Francis and have him answer as many as he can. 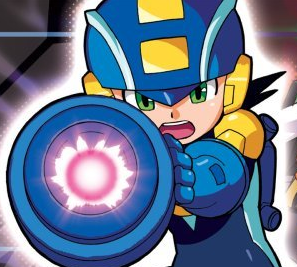 As a suggestion, try asking questions not only about his role as the blue bomber, but also about his work as an actor in general, you know, to mix things up a bit in order to prevent the interview from became repetitive or boring. I'll be taking questions from now until September 12th. Hop to it! Flash Man's BGM Vs. "Comin' Home Baby"
Discovered by Calc, a resemblance between Flash Man's stage music and Mel Torme's "Comin Home Baby." There's a major resemblance kicking in at :22' and onwards. What do you think? “…we don’t have an “official” mascot. We have a logo, that’s it. As far as unofficial mascots go, however, yes, MM would definitely be that. I have actually heard someone discuss this, and I think the reasoning was something akin to Mega Man best embodying the spirit of the company. With so many characters under their belt, I guess it is difficult to determine just who best represents Capcom....though I personally like to believe it has always been the late CAPtain COMmando. 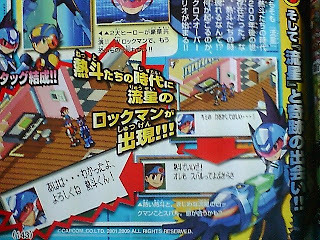 Gpara reports that Rockman EXE: Operate Shooting Star will arrive on Japanese store shelves November 12th, 2009. 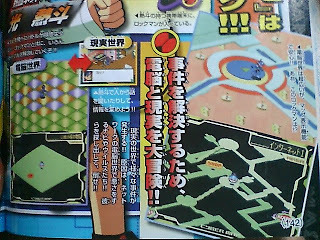 The report goes on to mention the game will contain new characters and a variety of new features. Additionally, Gpara has posted a few (old) screenshots for the game and two pieces of high quality artwork. Well, not much else to say than that! More OSS news as it comes in! This might look like your run-of-the-mill Mega Man NES cartridge, but there's a bit more to it than meets the eye -- it's actually a working external hard drive. Jammed inside the NES classic is 500GB worth of storage. It works with any PC, power supplied via USB. The best part? It's on sale for $150 at Etsy. Custom orders are acceptable, so if you want more HD space or a different game, just contact the seller. 8-bit Powered Up, Wily Tower In The Works? 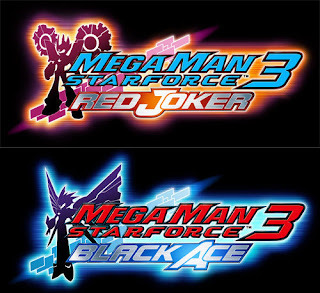 I'm all for this, especially if the titles turn out as good if not better than the 8-bit version of Mega Man 7. 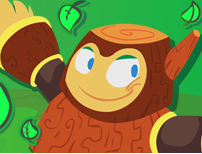 Future updates can be found over at Mend's official website. It's time once again to rock out to The Megas. 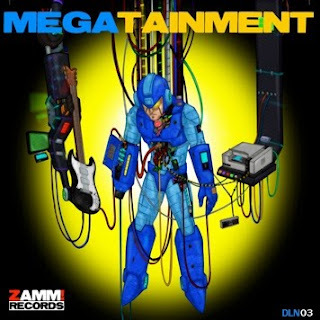 The Mega Man based cover band recently released their latest album, Megatainment, yesterday as part of a collaboration with Entertainment System. The soundtrack, featuring four all new Mega Man 1 inspired songs, is up for grabs on their online store for $5. Hard copies of the album, however, cost an extra $3 in shipping. Wanna listen before you buy? Head on over to the band's official Facebook profile for a few sample tracks. Good news for those of you purchasing the Irregular Hunter X/Rockman Rockman value pack from Play Asia: the bonus soundtrack will be included with the initial value pack shipments. A PA rep informed me they will be receiving a limited amount of soundtracks, thus supply will be constrained and probably won't replenish. For the uninformed, the soundtrack contains 30 tracks of music from both IHX and RR. Unfortunately, you won't be getting the entire IHX/RR score, most likely select tunes. The value pack ships September 17th, 2009. Dimension Diver Rockman - produced by custom design group, Dimension Diver, a fully pose-able "ball-and joint" classic series Rockman figure. When built, the figure is 11cm in height. 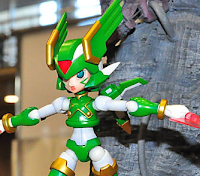 Atelier-Sai Rockman -classic series Rockman figure created by Atelier-Sai. Stands at 10cm when built. Atelier-Sai Forte - classic series Forte figure, 11cm in height when built. Atelier-Sai Zero - Zero series styled Zero figure. Approx. 10cm in height when completed. Atelier-Sai Harpuia - 11cm tall Harpuia model, my personal favorite! Bear in mind, you won't be bidding on completed figures, but, unassembled, sealed in box model kits. Serious construction is required! Also, the ball-and-joint mechanisms for each figure are sold separately. You can find them for $5 at Hobby Link Japan. 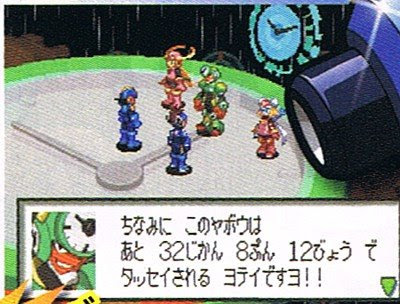 1997 saw a plethora of Rockman festivities and events to commemorate the series 10th anniversary. One such event was "Rockman Live Stage", a little known stage show which performed periodically throughout Japan in the fall of '97. Footage of the show in its entirety has yet to surface, but fortunately, there exists a brief TV spot of the event. I want that Wily costume. Been a while since my last voice actor interview (Lucas Gilbertson - Zero), so I figured I might as well give it a go again. Here's where you come in: of the voice actors/actresses listed below, who would you like to see interviewed? Battle Chips. Lots And Lots Of Battle Chips. 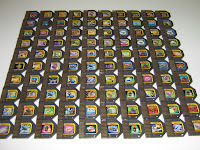 There's a big ol' pile of toy Link PET Battle Chips on Ebay - 926 chips to be exact. "These Battle Chips are for use with the Takara Rockman EXE "Link PET EX" handheld game system (not included). They can also be used on the Game Boy Advance "Beast Link Gate" accessory (not included). The Battle Chips themselves are predominately in mint, new condition. There may be a few with mild wear but for the most part the Chips are in exceptional collectors' shape and will definitely give your collection an enormous boost." The auction is currently at $31, ending within a day or so. Complete details and more pictures available here. 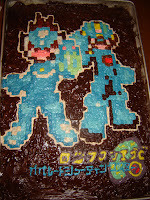 To celebrate his 21st birthday, Capcom Unity member XHunter whipped up an absolutely scrumptious looking Operate Shooting Star birthday cake featuring the dynamic Rockman duo. Needless to say, I'm totally impressed with the final product, maybe even a hint jealous that I don't get to sample such a masterpiece. Regardless...happy birthday XHunter! At last, Capcom finally decided to give the official OSS webpage an overhaul. So far, there's nothing extraordinary on the site yet, but lots of little things to keep our appetites whet for more. For starters, there's a pretty good amount of overworld screenshots . We've seen it all before, but never this clear. If there was any doubt before, graphically, OSS is of EXE 1 origin. The aforementioned section even offers a little bit more info behind Clock Man's motives, who is adamant on changing the course of history. Good guy or bad guy? Next, there's two areas devoted to jogging your memory for both the happenings of the EXE and Shooting Star series. The pages offer minor background details behind both series worlds and gameplay. EXE page here, SSR here. Over here, fans can check up on the OSS staff discussions (a blog) and send in their comments via E-mail. No region restriction, you're free to pop the staff a message, though I do suggest using a computer translator to send your text in Japanese. More updates are expected, so check the site often! "So, what exactly is this game? 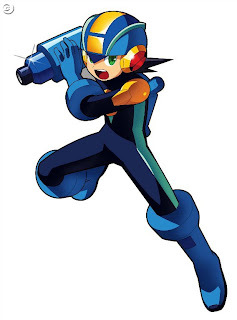 It is a presumably unlicensed game that was released by a Chinese development company known as Vast Fame for the Game Boy Color sometime in 2001 using a modified version of Mega Man Xtreme's game-engine. 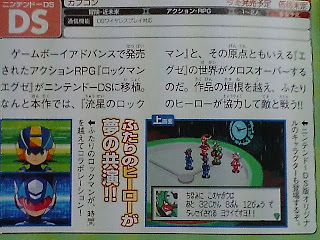 The game is part of a trilogy, with Rockman DX3 as the second part and Rockman & Crystal as the third-and-final installment. Although released as stand-alone cartridges, this game is often still released today in China by various cartridge producers as part of multi-carts." Inaccurate proportions? Shoddy designs? Must be the workings of a bootleg. 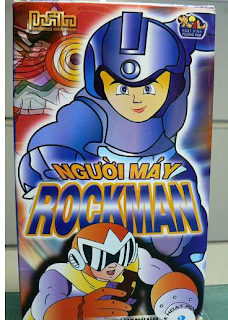 For your viewing pleasure, here's the box art for a bootleg Vietnamese version of Ruby Spear's Mega Man cartoon. The VHS is said to be quite common among local flea markets, retailing for the equivalent of two dollars. 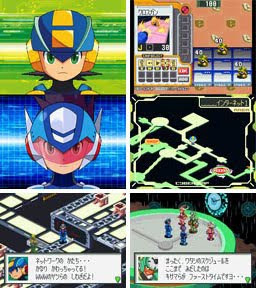 Proto Man looks great, (though his appearance in the top left is questionable) but what is up with Mega? Definitely a (crappy) tracing job, the basis of which, seen here. A for effort! Of note, the translations are computer based, so legitimacy is questionable. The post will be updated when a more concrete translation surfaces. Now, I know some of you are getting a little tired of the Jin Saotome custom figure posts, but this one is just too cool not to show off. Sorry. Without further adieu, I give you Tron Bonne and Gustaff: The figures stand at roughly 3 ¾, complete with fully articulated joints. Best of all, the Gustaff can be deconstructed to reflect battle damage. 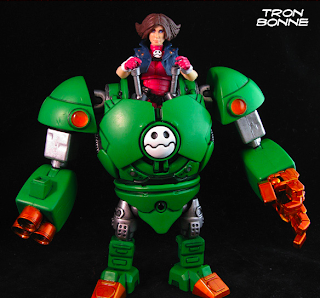 "From out of nowhere comes Tron, a feisty little lady with a hand for creating her own bizzare mechanical contraptions such as Ride Armors. Rock and Gung Ho encountered her while searching for a band of Air Pirates just outside of the East borders and were assaulted by her robotic helpers. After some long negotiations Miss Bonne begrudgingly agreed to help the Joes fight Wily and Cobra's forces when she realized some alliances are more dangerous than others. We will have to keep a close eye on her for the time being." You can find the auction for both figures here. Current bid at $31. Happy bidding! UPDATE: Oh Look, a spiffy Dr. Wily figure. Looks pretty sweet, it's got the crazy hair and everything. 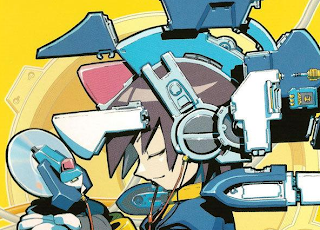 New Rockman CD In The Works? According to a post over at Ippo Yamada's official blog, a new Rockman soundtrack might be in production. Ippo Yamada, composer for various Rockman titles (Zero series in particular), is supposedly attached to the project alongside a few other unnamed artists. Ippo doesn't specifically say the soundtrack is Rockman related, but based on the fact that he's currently interviewing past Rockman composers for said soundtrack's booklet, I'd say that that's a major indication that something interesting is coming down the pike. Not much else to say than that. I'll keep you posted if anything new comes up. I could totally dig a Mega Man themed Guitar Hero. Too bad we won't be seeing something like this any time soon. Illustration by Zet via Joystick Division. The Speed Gamers' 72-hour, earthday Mega Man marathon has come to an end, reaching their goal of raising $7,000 in donations since Friday, August 14th. Fortunately, there is still time to send in your donations regardless of the marathon's passing; donations will be accepted until Wednesday, August 19th. A big hand to the Speed Gamers and those who participated - a splendid job well done for a worthy cause! Congrats! "A while back I mentioned something about a “program that can control time,” but it seems like they somehow completed a prototype! Then, Ace comes to me and asks of all things “Clark, if you’d like, would you want that program installed in you?” It seems to be for data collecting, but to get a program like that installed… I get kind of a special feeling. Hmm, but why would Ace choose me?" Once used for promotional purposes, these Rockman and Servbot statues now stand (and slouch) outside of the reception area, greeting those who enter the Tokyo office. Needless to say, they make excellent doormen. More photos via 941's visual Capcom Tokyo tour here. 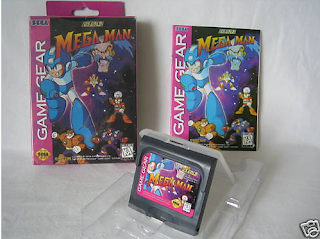 Up for grabs on ebay is a complete copy of Mega Man for the Sega Game Gear. Considered to be one of the rarer games in the series, the game, released by US Gold in 1995, is a port of MM4 and MM5 featuring enhanced visuals. The auction contains pretty much everything you could as for - box, manual, cartridge and even a handy dandy cartridge protector. Of course, all of this comes at a price; $99 plus the additional shipping. Collector's might not want to pass this one up. Mega Man dukes it out with Cut Man in this excellent speed drawing by Collecting Smiles. The scene was illustrated entirely on the homebrew Nintendo DS program "Colors." This is just too good not to share over here. 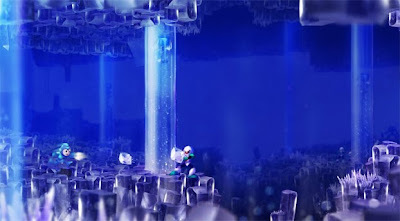 NeoGaf member Orioto whipped up a hand-made Mega Man PS3 theme entitled "Crystal Catacomb", a unique "high definition" re-imagining of Crystal Man's stage. The full sized piece in all its eye popping glory, here. 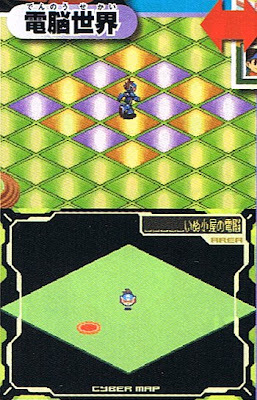 Unearthed by SuperMega, here's a very brief look at a prototype version of Mega Man X7. Hailing from Tokyo Game Show '02, the footage depicts a fully playable X in the intro stage; in the final, he's an unlockable character not available from the get-go. 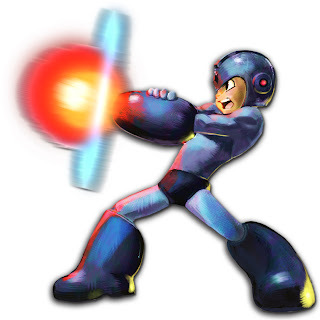 For the next 72 hours, the Speed Gamers will play Mega Man games nonstop, all for the sake of raising money for Earth Day Network charity. Sit back, relax and enjoy the show! 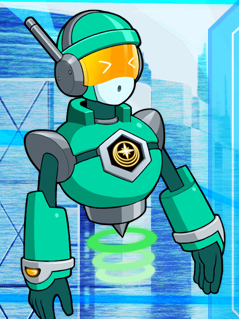 Let's check up on Star Force 3, shall we? According to VGChartz, SF3 sold an additional 9,000 units from August 1st though August 8th, charting at number 48 on the NA charts. Our grand total in sales is roughly 76,000 units. Nearly to the 100k point. Hopefully, sales will be consistent in the coming weeks to get us there. During a trip to Vancouver, Canada, PRC reader Master Otenko came across something of an oddity: A bootleg spinning top Beyblade toy featuring a very shoddy recolored Zero who makes an appearance on both the packaging and the aforementioned spinning top. Of course, this is not an official product from either Capcom or Takara (makers of Beyblade), but interesting nonetheless. It's certainly the first time I've ever seen something like this. Sounds a bit like a hint if you ask me. You never know what Capcom could be cooking. 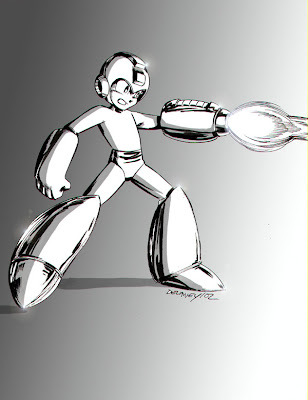 Unearthed today during my weekly hard drive rummage, here's a nifty illustration of Mega Man by famed DC Comic artist John Delaney. John drew the picture for the Toon Zone community a few years back as part of a series of weekly sketches. John would hold a poll each week asking TZN users what character they would like him to draw and it just so happened the Blue Bomber won the vote. Pretty cool looking, no? After what seems like forever, Marvel vs. Capcom 2 makes it's way onto PlayStation Network later today for $15. The latest edition of the classic 2-D fighter offers new features including online play, trophies, and cleaned up visuals. Additionally, the rumored PS3 retail package is available today too for $14.99. Inside the GameStop exclusive pack, you'll find a MvC2 redemption code and a one month subscription to Marvel Digital Comics. The retail pack is limited to 15,000 copies nationwide. 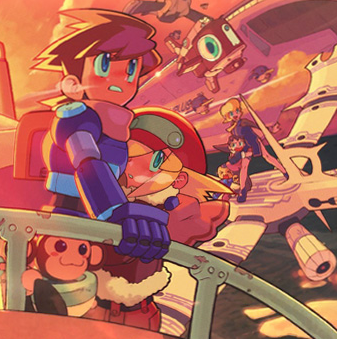 Udon Entertainment is showing off some major love for Mega Man recently. With plans to release the Complete Works art books and Megamix and ZX series manga in the US, these guys are really shaping up to be fans' new best friends. Can it get any better? 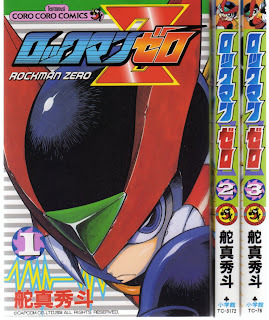 If you're a fan of Hideto Kajima's Rockman Zero manga, then yes, it can. I'm a little iffy on this due to the fact that the blurb didn't mention Udon's ZX manga plans. Is it possible NP meant to say ZX manga instead of Zero? That's right, pudding. Is there any product these guys aren't on? "I Am Pudding. Anybody Who Eats Me Will Be Happy. Try Me Please!" The Complete Works version of Rockman 1 hits the Japanese PlayStation Store tomorrow, August 12th. The download will run you a mere 600 Yen (about $6). Fortunately, there is no region restriction for PlayStation Store, meaning you can purchase the game even though you don't live in Japan. All you need is a Japanese PSN account (free) and a credit card. A step-by-step guide on setting up a Japanese PSN account here. UPDATE: Scratch that about credit cards. The JPN PlayStation Store does not accept non-Japanese credit cards. What you can do, however, is purchase a Japanese PlayStation Network card in order to redeem Yen. Instructions on how to find and use a Japanese PSN card, here. 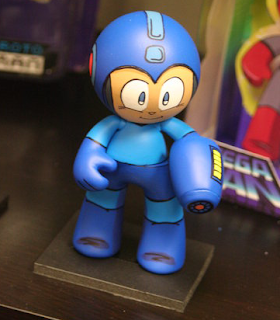 Curious as to what's up with the new vinyl Mega Man figures, I recently spoke with a representative of Jazwares. I inquired when the figures would see a release, and although they couldn't give me a specific answer, they said we should expect to see one or two figures some time in the fall. They also told me that the figures might be online exclusives available through places like Amazon, Entertainment Earth and Jazwares' own shop. 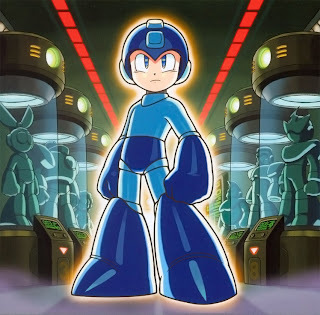 The initial line will consist of Mega Man, Proto Man, and Elec Man. More characters will definitely be released if they figures sell well enough. Another week, another set of Capcom Unity auctions and raffles. 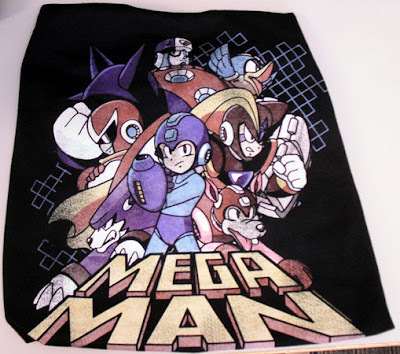 Among the lot are two Mega Man items: a retro styled t-shirt (pictured) and a set of Battle Network stickers. Remember, Unity auctions and raffles only cost you Unity points, so everything is practically free! Read up on how to bid here. Visit Hyadian's channel for more Mega Man remixed tunes. The missing page from Coro Coro Comic's Operate Shooting Star coverage has surfaced courtesy of this Japanese blog. 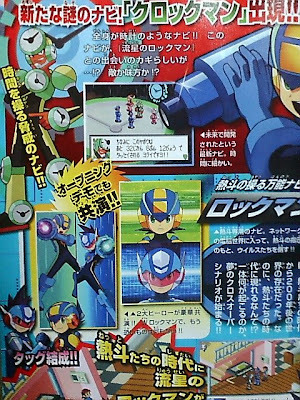 Nothing groundbreaking, just a couple additional screen shots and some nice artwork of Rockman.EXE and Netto. 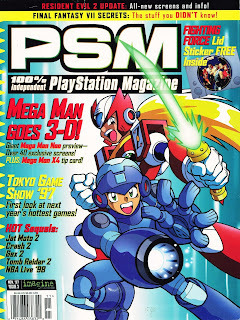 Mega Man Volnutt and Zero graced the cover of PSM magazine in late '97 as part of the issue's coverage for the then up and coming Mega Man Neo (aka Mega Man Legends) and Mega Man X4. The artwork was produced by comic artist Adam Warren. More scans from the issue including previews for MMNeo and X4, available here. Nerdballoon recently started an intriguing experiment by the name of 'Project D', in which eleven year old Dylan is exposed to classic video games for the very first time. 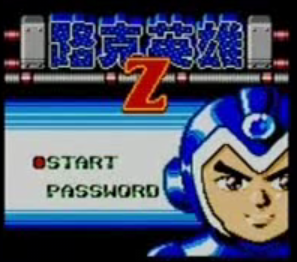 The most recent entry in the series was devoted entirely to the boy's impressions of Mega Man 2. Bottom line: he enjoyed the game; hated the music. "This is a print from a series of illustrations on vintage book pages. 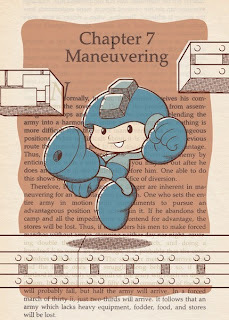 The illustrations are my re-imaginings of the video game characters nearest and dearest to my heart. Print measures 5" x 7" and is printed on professional grade matte photo paper. The image is centered on the paper with a white background for framing." Grab yours here while supplies last! 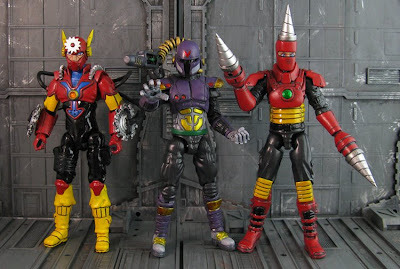 Jin Saotome returns with three brand spanking new G.I Joe/Mega Man crossover figures: Metal Man, Drill Man and Vile (VAVA). 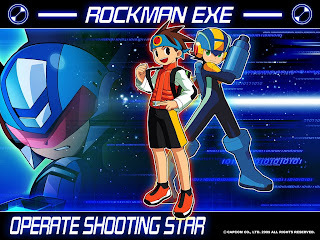 Not much is known at the moment, but what we can gather is that Shooting Star Rockman is playable within the EXE universe. Other characters such as Harp Note, appear as well. 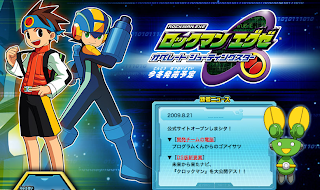 - SSRockman and Rockman EXE are playable. - Clock Man (aka Clock Genius) is a Navi from the future. Interacts with characters from the EXE universe. - Additionally, Clock Man gets his own area. - Graphically, the game uses the sprites from EXE 1. The over world is directly from EXE 1. - There is a map for the Internet on the bottom screen. - No word on how the battles will play out. Next issue of Coro Coro might touch on this.